Most of the financial media discussion around the recent bout of volatility in the stock market has been centered around higher interest rates. The prospect of rate increases is certainly a big factor in declining stock prices the last couple weeks. However, what’s been somewhat flying under the radar is the increase in oil prices. Crude oil climbed almost $10 per barrel from mid September to early October, reaching $76 per barrel before just recently settling back down to about $70. A move of that magnitude over such a short period would have garnered more attention had the price not pulled back over the last week or so. Still, higher oil prices can be a major headwind for the economy, especially one already dealing with a possible sustained increase in interest rates. So let’s say you felt that it was good time to own exposure to oil, either as a hedge or simply as a speculative bet. Of course, you could buy a big oil stock. Certainly the price of oil is correlated with the price of oil production companies. However, most stable oil stocks also have exposure to other industries such as natural gas and refining. Pure oil production companies aretypically smaller and riskier, and likely don’t offer a dividend. On the other hand, you could buy the United States Oil ETF (NYSE: USO) and get nearly direct exposure to the price of crude oil. The drawback of course, is that USO doesn’t offer a dividend. But what if I told you that you could own USO and generate an income? That’s where covered calls come in. You may have heard that covered calls are just for slow moving, dividend stocks. Or maybe you’ve seen covered calls used to add an income generating component to owning tech growth stocks. Both strategies are perfectly reasonable uses of covered calls. 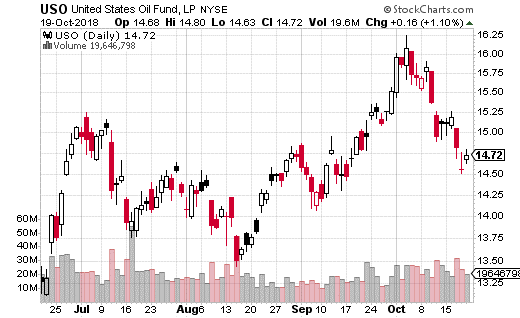 However, you can also write calls against just about any asset, even a commodity ETF like USO. By writing calls versus holding a long USO position, you are essentially creating a dividend payment on an ETF that doesn’t pay one. You are also keeping the opportunity open to make money on higher oil prices (by selling a call above the current price – we’ll get to that in a minute). What’s more, the call you sell will provide some downside protection from owning the ETF. With USO trading at $14.70 you could sell the January 18th 15.5 call for $0.48. That’s essentially a 3-month call. First off, by collecting the premium, you are protected down to $14.22 in the ETF price, roughly equivalent to a 3.3% drop in the price of oil. You can earn $0.80 (up to $15.50) in profit if the price of oil goes up, or 5.4% upside. And of course, no matter what, you’ll collect the $0.48 in premium from the call sale, a 3.3% yield. It should be readily apparent why covered calls are so popular. If you were to repeat this type of trade every 3 months, you’d generate about 13% yield from selling the calls – much higher than any established oil company would pay. Plus you have the extra 5.4% in upside you share with the price of oil. All told you could earn 8.7% returns in just 3 months if USO is at $15.50 or higher at January expiration. And don’t forget you are protected to the downside over 3% as well. If you are concerned about oil going higher or just want to make some extra money from higher prices, this USO covered call is a very simple way to take a safe, income generating position in crude oil. You can always tweak the covered call as well if you prefer more growth potential versus yield (or vice versa), or a longer or shorter time horizon. That’s just one more benefit of covered calls – they can also be very flexible.